The world is moving ever faster and sometimes it feels like a struggle just to hold on. With the constant bombardment of adverts, breaking news, tweets, social media updates and fear-mongering by anyone with Internet access, it’s no wonder that rates of anxiety, depression and mental malaise seem to have risen so sharply. Fortunately, there are people who are trying to make sense of it all and give us a way to speak out about it. Matt Haig is one of the best. A couple of years ago, Haig published Reasons to Stay Alive, a frank and moving book about his own struggles with anxiety, panic attacks and suicide. Its success was instant and profound. People across the world thanked him for his words and putting to paper the feelings they’d been struggling to articulate, as well as giving his own tips on how to improve things – or rather, showing us how he did it. He is at pains to insist he isn’t a psychological expert by any means, and his advice is merely based on things he has experienced, but sometimes that’s just a good start. Notes on a Nervous Planet is the wonderful sequel, this time focusing more on the speed of progress in the world, how the world seems to be working to keep us miserable and anxious (happy people don’t spend money), and how best to cope with things like Twitter and Instagram. We can all make changes to our lives that might alleviate some of the worst problems. The advice is often simple, or at least appears so: charge your mobile phone outside of your bedroom; don’t stay on Twitter if you’re not enjoying it anymore; read more often; do yoga; go outside more often. Nonetheless, I feel that it all helps. As someone who has had his own issues with anxiety and depression in recent years, it was refreshing to read via Haig’s wonderful prose that I’m not alone. It’s also important to have people talking about these things, as the more we talk about mental health, the more likely the attached stigma will drop away. It’s particularly important, I feel, to have a man talk about it. I appreciate that we live in a world that seems to assume “straight, white male” is the default and people are bored to listening to them, but generally men are told not to express their feelings and to “be strong” all the time. Robert Webb covered this in his memoirs too. This stuff needs to be said – everyone is allowed to cry, and everyone is allowed to feel. Haig’s book is short but full of profound and charming, lyrical sentences, as well as common sense advice. It’s also raw in places, as he recounts panic attacks and times when he thought he couldn’t carry on. I, for one, am enormously pleased he has, as he’s written some of my favourite books in recent years, including The Humans and How To Stop Time. Brilliant, beautiful, wise, and important. I don’t have many regrets, but a big one is that I didn’t study more history in school. It was compulsory for the first three years of secondary school and then became optional, at which point I stopped, meaning I haven’t had a proper history lesson since 2002. In the past five or six years, however, I have got back into history and started finding it fascinating. OK, I have limited interest in the particulars of warfare, and anything about the textile industry seems important but is just really dry, so I prefer the darker, weirder, funnier and less recognised parts of history. This brings us to Greg Jenner. Greg Jenner is a historian who was the sole person responsible for historical accuracy in the Horrible Histories TV series, a series that I’m well aware was for kids, but nonetheless was hugely entertaining. This time he’s turned his attention to an older audience, sharing with us a strange history of every day life. In this book, he details the events a modern Saturday and explains how all the things we take for granted have long, and sometimes bizarre, historical origins. By looking at an average modern day, he follows us from waking up to our morning routine, meals, dog walking and socialising, right up until bed time comes and we set the alarm clock once more. Along the way he introduces us to the chequered and interesting histories of toilet paper, toothbrushes, champagne, bread, underwear, dogs, newspapers, table manners and even time itself. Along the way we’ll discover that what we do isn’t really that much different to anything humanity has been doing since the time of the Stone Age. Witty, sharp and occasionally silly, the book is nonetheless completely factual and straddles that perfect line of educating while entertaining, whether discussing how forks came to exist, the fastest ways to send messages, or detailing just what exactly the customs were throughout history regarding sleeping arrangements. We meet history’s most famous faces and encounter some that we may not know so well, even though their achievements continue to be important in modern times. I’m thinking of the monk Dom Perignon for one, whose addition to society is probably obvious from his name, or Pierre Fauchard, the man who invented false teeth, fillings and braces. It’s a book that will undoubtedly make you think, and make you realise that so much of what we take for granted has such hugely complicated origins, as well as that history does indeed move in circles, as people chop and change their habits depending on what’s fashionable. Perhaps the most pervasive of the ideas is that all of this has been going on a lot longer than we think, and that clothing, beer and beds have been going on since our caveman days. The notion of breaking the book up into chapters comparing history to modern day is brilliant. It means that each chapter has a specific topic. For example, the first chapter, in which we bash our alarm clock into silence upon waking allows for a talk about how we measure time and have come to use the calendars we do. The second chapter has us attend to natural business at the toilet, giving us a chapter on the history of this essential item. And on it goes, from breakfast to bedtime. Anyone with even a passing interest in history can enjoy this, and it’s full of tasty nuggets to bring out at any social occasion at any time of day, although maybe some of the ones about hygiene and the ever-changing standards of cleanliness throughout the ages are best avoided over the dinner table. A really compelling and hugely fascinating read. I don’t have much truck with many awards, and I usually find that whatever ends up winning an Oscar, Man Booker, Emmy, Brit, and so on, I’ve never seen, read or heard. One of my friends thinks this is because I like to shun things that are popular, but that doesn’t take into account my obsessive love of Harry Potter, among other things. I think generally it’s because the sort of books and films that win these awards generally never really appeal to me. They seem to have been created for the award and the award alone. In particular, the Man Booker Prize is something that I’ve never really paid attention to. I have, however, read three of them. Well, two and a bit. I started The God Of Small Things at university and despised it, giving up after a few chapters. I read Alan Hollinghurst’s The Line Of Beauty a few years ago and enjoyed it. And this brings us to the third Man Booker Prize winner I’ve ever read – The White Tiger. This is the tale of Balram Halwai who grew up in a poor caste in a dirty village of India. Despite his caste being sweet-makers, his father was a rickshaw puller, having had his destiny stolen from him. Attempting to make something of himself, Balram is employed by a local rich man and his family, and becomes their driver. Balram is a honest, hard-working servant who comes to struggle with his position. He realises that the caste system once so prevalent in India has been replaced by a much simpler one – the haves and have nots. He sees himself as a white tiger, a rare beast that comes along once in a generation and cannot be tamed. His employers begin asking more and more terrible things of him, and as things come to a head, Balram decides to do something drastic to free himself from this life that he doesn’t believe he deserves. The framing device is that the story is told over seven nights in a letter to the Chinese Premier, Wen Jiabao. This seems odd, but Balram is keen to tell Jiabao about how India is a country full of entrepreneurs and go-getters. Whether Jiabao ever reads the letter, or even receives it, is never disclosed. There are so many themes running throughout this story. There’s an ongoing battle for Balram’s independence and his insistence that he is not like other men, which for the most part he isn’t. He discusses the political situation in India, although he doesn’t necessarily get all the ins and outs of it, and he is aware that the people are locked in, what he terms, a “rooster coop”. That is, no one can escape alone from the position they are in, and no one else is going to help them do so. It’s also a tale of globalisation, with Balram’s master Ashok being a fan of America and New Delhi being full of strip malls, call centres and hotels that are all only there because of Western development. Like Lucky Jim, oddly enough, the biggest theme though is perhaps class. Balram notes that people either have big bellies or they do not, declaring that the divide between the rich and poor is stronger than ever, and hugely obvious to anyone who’s looking. It’s a darkly funny book, biting and caustic towards the situation in India, and it opened my eyes to what things are like there. Balram is fairly likeable, even with his final acts (corruption is another ongoing theme, one that he first dislikes and later comes around to understand), but I never quite understood how old he was meant to be. It’s never explicitly stated, so in my head he is in his twenties, but may well be older. Overall, the book served to prove to me that just because it won a Man Booker Prize, it doesn’t mean I should write it off as something I wouldn’t like. It’s a smart book, a brilliant debut and well deserving of a place in modern literature. My Coupland journey continues into 2015, but there are just three more to go, the last of which isn’t even a re-read, but rather his most recent novel that I’ve been saving until I finished all the others. His books have always been somewhat raw, yet funny; but this one is probably the bleakest one so far. Roger Thorpe is in his forties, divorced, drunk and working at a branch of Staples. To pass the time, he writes in his diary, either his own thoughts, chapters of his first novel, or entries pretending to be his colleague Bethany. Bethany herself is an overweight goth who mostly ignores Roger, until he accidentally leaves his diary out and she is shocked and creeped out to find that he’s been pretending to be her. She is even more shocked and creeped out by the fact that he’s getting it right. The two begin to swap letters with one another, although never actually talk on the shop floor, and between their strange blossoming friendship, they learn more about one another and Roger gets feedback on his novel, Glove Pond, in which Steve and Gloria (a drunken writer and his actress wife) attempt to hold it together in front of an up-and-coming new novelist who threatens Steve’s ego. Like all Coupland books, it’s about not knowing who you are and why that’s OK when you’re young. 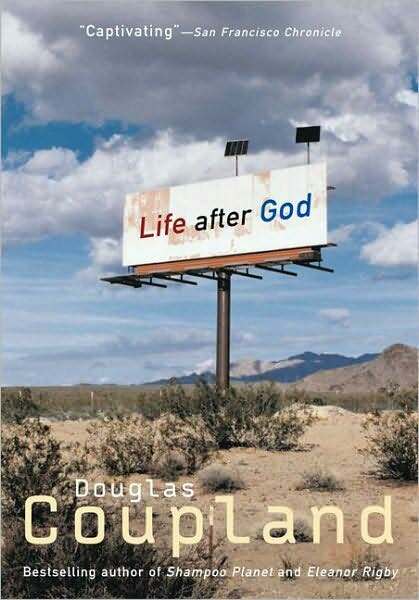 Most of his books deal with that element of being young – Generation X, Microserfs and Shampoo Planet particularly – but as Coupland as aged, so have his characters, and the feeling of loss and confusion is no less prominent. Roger had a pretty good life, but threw it away after one drunken mistake and now he’s all alone, wondering what the purpose of anything is anymore. Once Bethany realises that he’s not such a creep, she begins to feel sorry for him, as she’s already seen what loneliness and confusion can do to people, with her mother DeeDee being a prime example. The novel is told through the letters of Roger, Bethany, DeeDee, Roger’s ex-wife Joan and a few others, with chapters of Glove Pond throughout. And even inside Glove Pond, we see the novel one of the characters there is writing, a novel which seems to mimic the outermost layer of this onion-like tale. This is a somewhat bleak book, but there is a sense of hope. Coupland’s characters are aware that they need to change if they want the world to be a better place, but this is so much easier said than done. While dealing with hopelessness and our interior struggles, it also touches on the absurdity of consumerism, Hallowe’en costumes, corvid intelligence, aging, and holds up as a shining example of how life is never quite what we want it to be, no matter how hard we try. It isn’t my favourite of his books, but I still like it. It’s full of all the wonderful observations that make Coupland what he is, but there’s definitely a lot more sadness here than has appeared before in his work. As Coupland ages, so do his characters, and so do the messages, although the one message that never changes is simply that: nothing really changes unless you make it change. If you want to read more of my writing, my debut novel The Atomic Blood-stained Bus is available to download from Amazon, iTunes and all other ebook retailers. For centuries, religion and faith in an almighty were central factors of the way life worked. Church was important, prayer was necessary, and no one had come along yet that had really had a convincing enough alternative. However, over the last couple of hundred years, and in the last few decades in particular, things have changed. Society is less interested in organised religion and is more enthralled by blockbuster movies and bargain stores. So what happens to us in a world that is now run by Hollywood rather than the holy word? Coupland is back with a few short stories detailing some struggling people. In these eight short stories, Coupland gives us a collection of nameless narrators, each struggling to cope with loss, loneliness and a lack of emotion. Many of them lament the loss of God from their lives, while others are simply struggling to come to terms with growing up and the modern experience. They’re all seeking out something they’ve lost, or simply trying to escape. Stories cover a man whose wife has fallen out of love with him, a man lost in the desert trying to hide a stash of illegal steroids, a man who has found himself in a tent in the middle of the forest, and a whole group of people detailing where they were and what they were doing during the end of the world. Like all of Coupland’s stuff, he’s right on the money with how the world works. He is phenomenally smart and can get some truly profound thoughts out that others can only dream of imagining. As I’ve quoted his work in my other reviews of his books, it would be a shame not to here as well, although narrowing the quotes down to just a few is nigh-on impossible. 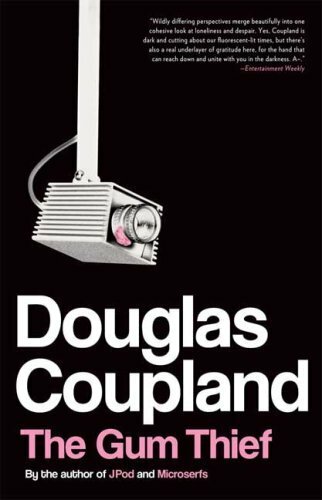 While this isn’t my favourite Coupland – wasn’t after the first read and still isn’t now – it remains a beautiful, hopeful breath of air and is a vital part of his catalogue. If ever you feel that you life has lost its meaning, read this and you’ll immediately feel less alone.